The new series will be revealed Saturday, November 4, 2017 from 1:00p.m – 7:00 p.m. at the Eve J. Alfille Gallery and Studio, with guests enjoying a “Bubbly Bar” and festive refreshments, a live music ensemble, raffle prizes, and Evanston-made art jewelry. 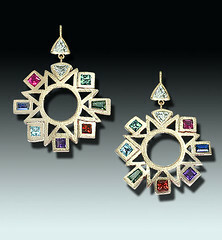 Evanston, IL – Raise your glass, it’s time to toast three decades of gorgeous fine art jewelry! Enjoy an intoxicating array of brand new designs from the series “In Great Spirits,” designed by Eve herself in anticipation of the 30th anniversary of the Eve J. Alfille Gallery & Studio. Come see what she’s been brewing, and join in the ‘spirit’ of the day! A series which exists as a celebration in itself could obviously draw inspiration from many different avenues…in this series, Eve’s mind escaped the familiarity of downtown Evanston to wander the countryside. “I think of the harvest,” says Eve of her designs “…of fruit before it goes to the press, of the new wine, and of growing hops.” Such a robust palette of flavors will be expressed through a wearable cornucopia of “tourmalines, green sapphires, rubies, gold in warm tones, and lush pearls” sure to please even the choosiest sommelier. “The Night They Invented Champagne” Earrings, copyright: Eve Alfille. Photo credit: Matt Arden. The opening celebration will feature a “Bubbly Bar” and other luxurious libations, mouthwatering morsels (including a visit from the famous Stan’s Donuts truck!) and the opportunity to win either a Chopping Block Gift Basket worth $200, or an Eve Alfille “In Great Spirits” necklace, no purchase necessary! Revelers will also enjoy a live classical ensemble, and will receive a 30th Anniversary Series charm with a purchase of $750 or more during the party! Join us in ‘popping the cork’ on November 4, 2017 from 1:00 p.m – 7:00 p.m. at the Eve J. Alfille Gallery and Studio. Please send RSVPs to either 847-869-7920 or contact@evejewelry.com. 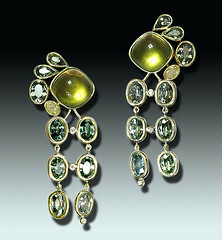 To learn more about Eve Alfille and see more of her works, visit www.evejewelry.com. 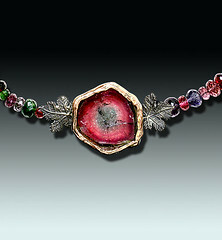 French-born artist, archeologist and gem expert, Eve Alfille opened her Evanston, IL-based gallery and studio in 1987. The Eve J. Alfille Gallery & Studio creates one-of-a-kind, art-inspired jewelry hand-crafted at the Gallery. Eve is also the founder of The Pearl Society and an officer of the International Pearl Association.